Annual per capita consumption of chicken in Sri Lanka, which was barely 2.5 kg a decade ago, has now reached 8.2 kg and is likely to reach 10 kg in the near future. While consumption has risen more than three-fold, prices have remained virtually unchanged during this period.This can be attributed to the extremely efficient practices adopted by Sri Lankan chicken growers across their production, processing and distribution systems. They have implemented global best practices in technology and breeding, which has led to more efficient production and significant reduction in costs, which they have passed on to the consumer. right down to delivering the chicken to supermarkets and retail outlets. 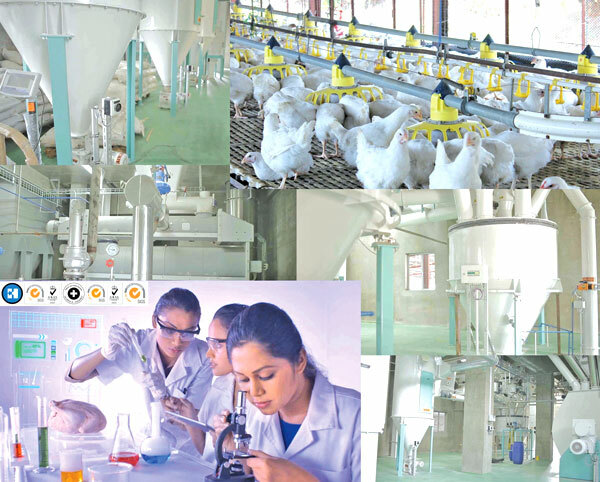 In fact, Crysbro is Sri Lanka’s first chicken producer to achieve full vertical integration. Yet, rising costs remain an issue that chicken producers have to constantly battle against. Cost of feed alone accounts for up to 70% of the total production cost. In addition to grains such as rice, maize and soya, poultry feed should contain a balanced protein diet, which is a practical application of the Ideal Amino Acid profile, which stipulates the correct minimum levels of essential and non-essential amino acids to be included in the poultry feed. Reducing the cost of feed invariably leads to a reduction in the body weight of birds, thereby negating any savings achieved by adopting this measure. Thus, chicken breeders have no way of reducing this component of their costs. Bio-security and sanitation practices adopted by chicken breeders may ensure superior quality and freshness of their chicken, but they also make costs escalate. For instance, Crysbro carries out vaccinations and health check-ups for its birds, in addition to regular testing of its breeder farms, hatcheries and processing plants for biological and chemical pathogens. As an HACCP certified organization, Crysbro also follows the Hazard Analysis and Critical Control Points or HACCP systematic, preventive approach to food safety from biological, chemical and physical hazards in its breeding, production and distribution processes. As Sri Lanka's only chicken producer to receive the ISO 14001 environment management systems certification, Crysbro takes its commitment to the environment seriously. The Company treats waste water at its state-of-the art treatment facility, prior to releasing it back as clean water. This process is supervised by the Central Environmental Authority, as well as the University of Peradeniya. Thus, the cost of preserving the environment should also be factored in, when considering the total cost of raising chicken. However, it is the cost of high taxes that concerns chicken producers most, as they have absolutely no control over it. Poultry the only meat-based industry in Sri Lanka that pays NBT and VAT, compared to others in the same sector. This may seem unusual, when one considers the fact that the poultry industry continues to make a significant contribution towards the national economy. In addition to saving millions in foreign exchange, which would otherwise be spent on importing chicken, the industry offers direct and indirect employment to hundreds of thousands of people. Crysbro alone offers employment to thousands of people as Contract Breeders, helping their families rise above the poverty line. In making chicken affordable to a majority of people by keeping prices low through efficient production practices, chicken producers have played a singular role in increasing the per capita consumption of animal protein, which is vital for the physical development and well-being of the population, especially the youth. It should be noted that chicken remains the most affordable source of non-plant based protein in Sri Lanka. While the recent increase in the retail price of chicken has offered a welcome, though belated relief to chicken producers, providing them with more incentives, as well as a conducive regulatory and fiscal climate could help the industry grow by leaps and bounds. In fact, if one considers the international per capita consumption of chicken which currently stands at 17 kgs, about twice our national average, Sri Lanka's chicken industry still has a long way to go.